Parties to the Paris Agreement are under pressure to meet the December 2018 deadline to operationalize the climate accord. Building on prior analysis and the firsthand experience of negotiators and other key stakeholders, this working paper by the Project for Advancing Climate Transparency provides both an overarching vision and practical suggestions for the foundational elements of the Paris Agreement’s implementing guidelines. This unique analysis should help negotiators overcome the remaining negotiating hurdles in order to achieve clear, robust and cohesive implementing guidelines. The world’s governments are working toward a December 2018 deadline to adopt the foundational elements of the implementing guidelines to operationalize the 2015 Paris Agreement. This paper seeks to support negotiators by addressing the significant challenges and gaps that remain to achieving clear, robust, and cohesive guidelines. It provides both an overarching vision and practical suggestions for implementing the guidelines during every phase of the Paris Agreement’s implementation—planning, implementing, and reviewing. For each element of the Agreement that requires guidance—ranging from common timeframes and cooperative processes to communicating and reviewing national or collective progress—the authors identify core requirements alongside suggestions for crafting effective guidelines. Building on 20 years of experience in the United Nations Framework Convention on Climate Change, the authors promote mutually reinforcing implementing guidelines that leverage the linkages between elements of the Paris Agreement. The authors acknowledge that government and nongovernment actors play a role in holding countries accountable for implementing and increasing climate actions, while fostering sustainable development. This guidance will help negotiators adopt rules that enhance national and global climate action and support and maximize the chances of meeting the Agreement’s goals in a fair, inclusive, and trustworthy manner. The Paris Agreement’s implementing guidelines—also known as the Paris Rulebook—are essential to operationalize national and international contributions to combat climate change in a fair and effective manner. The guidelines will create the framework for how countries will implement their climate plans and bring the Paris Agreement to life. Parties to the Paris Agreement set their meeting at COP24 in December 2018 in Katowice, Poland as the deadline for developing and adopting the implementing guidelines. The Paris Agreement implies a cycle of planning, implementing, and reviewing progress of climate actions is essential and that developing implementing guidelines is necessary to support the cycle. This cycle can guide governments by illustrating the iterative nature of the Paris Agreement’s approach. For the planning phase, countries develop and communicate their nationally determined contributions (NDCs) and adaptation efforts, and can use indicative information on future financial support to identify opportunities to go further and faster. In the implementation phase, countries work to meet their contributions and report on their progress to the international community as well as to their national stakeholders. Finally, in the review phase, countries participate in a technical expert review of their individual efforts, then share their experiences and best practices with their peers in a multilateral setting in a facilitative manner. Finally, they undertake a global stocktaking of collective progress toward the Paris Agreement’s goal. Countries struggling to meet their requirements, or facing other systemic issues, can be referred to the committee established to facilitate implementation and promote compliance. Following the review phase, countries can use new information to reconsider and strengthen their NDCs in light of their different national circumstances. The deadline of December 2018 is very quickly approaching, and Parties are under pressure to adopt guidelines in order to drive effective implementation of the Paris Agreement. Adopting clear, robust, and cohesive guidelines is necessary for building trust, confidence, and credibility in the international climate regime. Clear guidelines will enable all Parties to understand their obligations. Robust guidelines will signal a level playing field. Cohesive guidelines will effectively incorporate linkages across the various elements of the Paris Agreement. Clear, robust, and cohesive guidelines can support long-term support the international climate regime, steer national policies, send market signals, and establish processes for shared learning. It is critical to meet the December 2018 deadline for the adoption of the foundational elements of the implementing guidelines to set in motion the five-year cycles of action established under the Paris Agreement and enable Parties to plan effectively and respond to the call for enhanced ambition. To adopt implementing guidelines this year, negotiators must navigate sensitive and potentially divisive challenges, including how to reflect differences in national circumstances while driving climate progress by all. Reflecting these differences, while maintaining the “Paris spirit” of solidarity, trust, and ambition, will be difficult but can reap dividends in terms of strengthening the global commitment for long-term climate action. A second key challenge—and opportunity—is to leverage the linkages between different elements of the Paris Agreement to create a cohesive package that enhances national and global climate action and support. Another challenge—and opportunity—is developing durable implementing guidelines that can be adjusted to scientific, technological, and societal change and progress. Making sure that the set of adopted guidelines are inclusive provides an opportunity to accelerate the pace and scale of investments and actions necessary for the transformation to a low-carbon and climate-resilient society. This paper is designed to support international negotiators in adopting clear, robust, and cohesive guidelines in December 2018 for implementing the Paris Agreement. 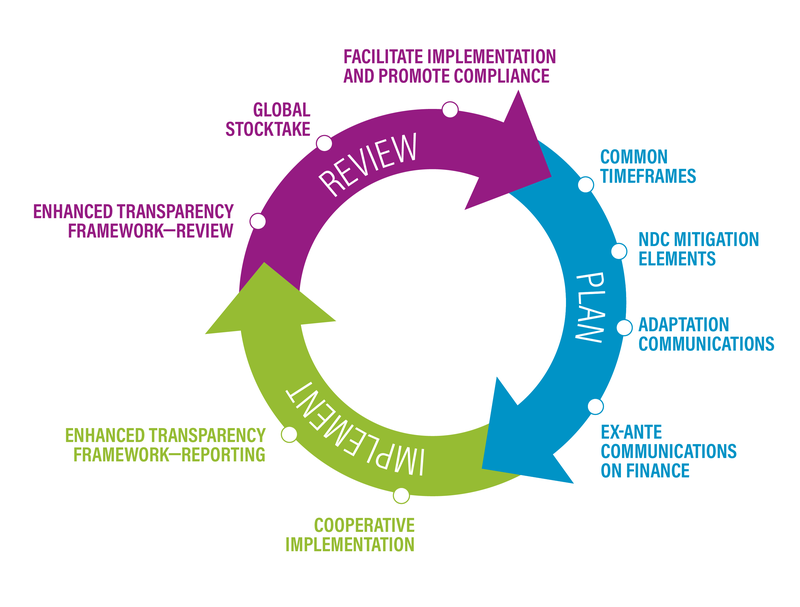 While previous PACT publications focused on individual parts of the implementation cycle and related guidelines, this publication guides negotiators through developing rules to implement the Paris Agreement. Though negotiators face a challenging task, the PACT consortium hopes they will find the suggestions for individual elements useful and will use our overall vision for designing the Paris Agreement implementing guidelines as a catalyst for action and support.